Wealth transfers are without a doubt are some of the biggest obstacles we face as we attempt to save money and build wealth for the future. Understanding what wealth transfers are and what you can do to avoid them, or reduce their impact on your financial life, is extremely important if you are going to come anywhere close to achieving your maximum financial potential. 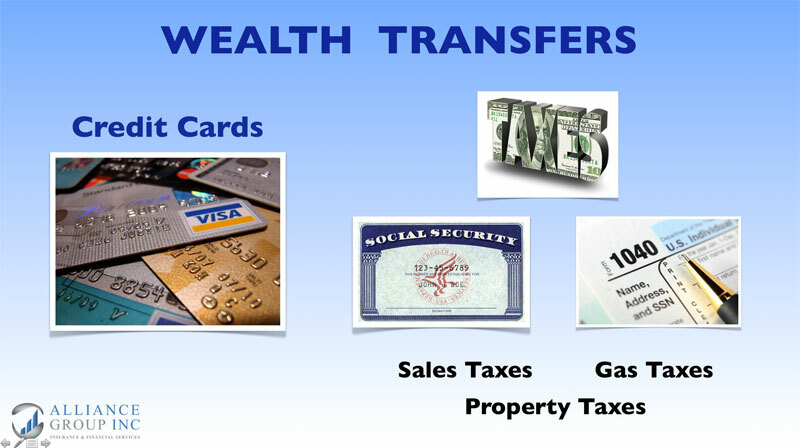 So what is a wealth transfer? 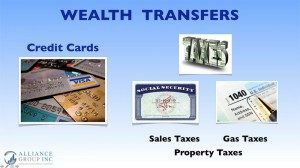 A wealth transfer could be defined as any financial transaction in which money leaves any of your financial accounts never to return. Once you understand what a wealth transfer is, you will be able to identify them, and begin to strategically reduce or eliminate their negative financial impact in your life. Consider your car payments, when you make a payment to the financial institution of principal and interest, they deposit your check into their account for their future benefit and use, not yours. While it’s true you are receiving many great benefits from your opportunity to drive the car they financed for you, but the actual dollars you sent them in the form of payments, are a wealth transfer! You are never able to enjoy any of the future financial benefits those car payments are producing for the finance company. Let’s consider the financial impact or wealth transfer we experience in the purchase of just one car. 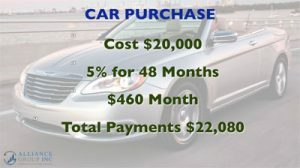 Suppose you decide to finance a $20,000 car at 5% interest for 48 months. You would have a payment of approximately $460 each month. At the end of 48 months you will have paid the finance company just slightly over $22,000 dollars. This represents your initial wealth transfer. You have the vehicle but you no longer have $22,000 dollars. But the wealth transfer doesn’t stop there. The finance company can continue to loan your $22,000 for as long as they are in business! If the finance company was able to reinvest or re-loan your money at 5% for the next 40 years, your $22,000 dollars would now be worth over $140,000 dollars! Had you not needed or wanted a car, you could have saved and invested your $20,000 dollars at 5% for the same 40 years and you would now have the $140,000 dollars instead of the finance company! This is what is meant by a wealth transfer. By the way, this wealth transfer would occur even if you paid cash for the car. The only difference is, a car dealership got to use your $20,000 for their benefit and investment purposes. And more than likely they earned a lot more than 5% per year on it! So in actuality, you finance everything in your life. If you pay cash, you give up the opportunity to earn interest on that money forever, just the same as when you finance something, either way there is a cost and the money is out of your control and does not grow for your benefit. There are many more wealth transfers in your life. For example, credit card payments. Again, every payment leaves your checking account never to return, never to accumulate or earn interest for your benefit. Taxes are another wealth transfer. State and Federal income taxes are wealth transfers. Sales taxes are wealth transfers. Gasoline taxes, property taxes, virtually all taxes are wealth transfers! While it’s true that there are some taxes, such as Social Security you may ultimately get some of the money back, but with most taxes, that is not the case. Most insurance payments are wealth transfers. When you pay your insurance premiums, whether it be for car insurance, homeowners insurance, health insurance or life insurance, the only way you’re going to see any of that money back is if something bad happens! You wreck your car, your home was damaged in some way, you experience a health challenge or you have the misfortune of dying! Most people would rather not receive any money back as a result of insurance claim! Every premium dollar the insurance companies get to keep, they get to reinvest for their benefit, not yours! These are just a few of the many wealth transfers we encounter nearly every day! The good news is, as we identify them, we can begin to implement financial strategies, one of which, is the family banking plan financing strategy. There are many other unique financial strategies we can use to prevent wealth transfers or at the very least reduce their effect on our ability to create and build wealth. Financial strategies that eliminate or reduce the impact of wealth transfers in our lives, allow us to retain many more of our hard earned dollars which we can then put to use for our own benefit now and in the future. As we retain more of our income, we now have the opportunity to come closer to our maximum financial potential. Because we have more of our paycheck still in our checking account we can begin to direct those dollars into financial strategies that create more benefits for us now and more benefits for us in the future. Because we have more money we begin to have greater financial certainty in our lives. Because we have more money, our life may become less stressful and more enjoyable. Because we have more money we can face the economic future with a great deal more confidence. If you would like to learn more about how to identify the wealth transfers in your life and the financial strategies that will help you significantly reduce their impact on your financial life, then you should get your free Wealth Transfer Analysis by clicking on the button below.